When I was in college, I was in a sorority. Each of us welcomed a "little sister" by making her a door sign for her room. They were all the same - each had our little sister's name, our sorority name, and our mascot, which was a bear. We were even given a pattern to create it. Despite that, my poor little sister's door sign looked like it had what can only be described as a cross between a mutant mouse and Jabba the Hut on it. Needless to say, I am not artistic or crafty AT ALL. And I reeeeaaaallly wish I could be. I see the beautiful and clever things that other people create, and I know there is no way I could do that. I don't even have a craft board on Pinterest, because - duh. Not crafty. 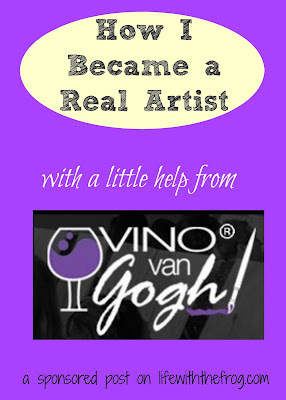 So when I had the opportunity to attend a Vino Van Gogh event, I was intrigued. Vino Van Gogh is a way for participants to create art while socializing at a restaurant, wine or coffee bar, or other local venue. The instructors are artists, art teachers, and others with a passion for art who use certain instructional techniques to help the participants create real art. Honestly, I thought there was no way I would be able to recreate the work of art, which for this event was Sahara Elephants. This is what we were to recreate. But I was excited to try because my (now four-year-old!) loves elephants. The event was held at a place called Wine Styles, so of course loving wine and inviting my BFF Diane made it more appealing. Our instructor, Carl, is an artist who splits his time between our city and NYC, where he paints sets for Broadway shows. He was a great teacher. True to Vino Van Gogh's model, he led us step by step through the painting. He told us which colors and which brushes to use and advised us on which stroke techniques would be best. Already all looking slightly different. The class was filled with a variety of people: best friends, couples, a mom and daughter, and some single people. Next to me was a professional cake decorator and across from her was a young woman who considered being an art teacher. Theirs turned out so good! According to Carl, it's not about duplicating the painting, but interpreting the art in your own way. Really, everyone's painting looked similar to the original, but enough different to be original. One woman even left the elephants out of hers. This is the "would-be" art teacher's painting. I had a blast. For me, drinking wine definitely helped. Diane said drinking wine made hers worse; but Carl gave her lots of help and direction without ever once judging. I would definitely attend one of these events again - what a fun girls' night out! Wine Styles was a great location for this. The girl working recommended a perfect wine for us, and - as I started to get a little too loopy - also recommended the perfect cheese and crackers to go with it. Diane and me with our paintings. Vino Van Gogh has events in several cities across the Midwest in Nebraska, Iowa, Missouri, Illinois, Arkansas, and Kansas. Check their website for a location near you. They also run coupon specials frequently, so sign up to receive their newsletter so you can know when and where events are. Sign up according to a preferred venue, artist, or painting - it's your choice! You can also follow them on Facebook. I can't stress enough that even if you don't think you're an artist, you can do this. If I can, anyone can! And if for some reason it doesn't turn out, just remember Vino Van Gogh's motto: Paint, drink, and be merry! *Diane and I received complimentary tickets for this event. All opinions are my own, and I would totally pay to go again!